Matt Bartlett scores early in the third to tie the game. The DHS Boys hockey team fell 4-3 against the Broncos Tuesday night. A 3-3 tie was broken with 0.02 seconds left on the clock in the third, sealing the fate of the Eagles. Kim Wildhaber faced 32 shots for loss. The Eagles were down 2-0 after the first and 3-2 after the second. A goal 46 seconds into the 3rd tied the game. The boys dominated the play for most of the 3rd but came up short as Kenora capitalized on a neutral zone turn over to score the winner. Next action is Tuesday in Fort Frances. 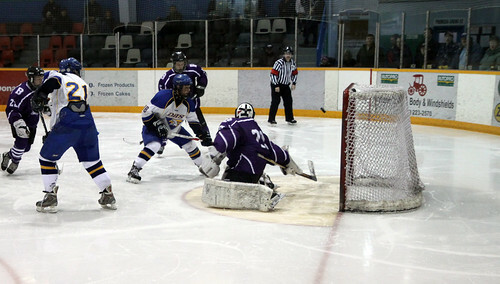 The Eagles Girls brought home a 4-1 win over the Beaver Brae Broncos.